Salento, Lu Salentu Salentu in the local dialect, is a land suspended between east and south. The ‘heel’ of the Italian ‘boot’, with its 3 provinces – Brindisi, Lecce, Taranto – and 2 seas – – the Ionian Se and the Adriatic Sea..
We are in Torre dell’Orso, one of the Marinas of Melendugno, on the Adriatic coast in south Salento. Torre dell’Orso is the ideal base for exploring Salento and the delightful region of Apulia, visiting Lecce, Otranto, the numerous village festivals, the Night of the Taranta Festival. Admire the Bay of Torre dell’Orso from the 16th century coastal watchtower built in the time of Charles V to offer protection against Turkish pirates, or from the cliffs at each end of the bay. Don’t miss the view of the 2 legendary sea stacks, the Two Sisters, or the Grotto of Saint Christopher with its ancient votive inscriptions. Swim in the natural pool in the Grotto of Poetry at Roca Vecchia and visit the coastal archaeological site which includes the remains of an old castle razed to the ground by the Turks in 1480 – the Siege of Otranto – and settlements dating from prehistoric times up to the present day. 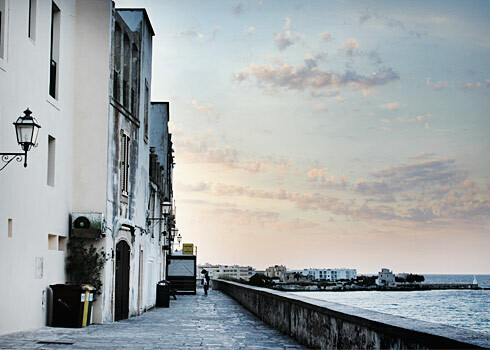 Otranto – waterfront and sea view. Catch breathtaking views of the port of Italy’s easternmost city, known as the Door to the East. Other musts: the walled Castle, a charming old city centre with narrow alleys and monumental architecture, the Cathedral with a mosaic floor depicting the tree of life and the chapel with the remains of the 400 holy martyrs. On your way back to Oasi Salento, stop at the Alimini Lakes for some oysters from the fish farm shop or enjoy the countryside on horseback. Enjoy Lecce’s old city centre, beautiful by day, enchanting by night, overflowing with Baroque churches, like the Church of the Holy Cross. Don’t miss Piazza Duomo and Via Libertini with their extraordinary Roman ruins. 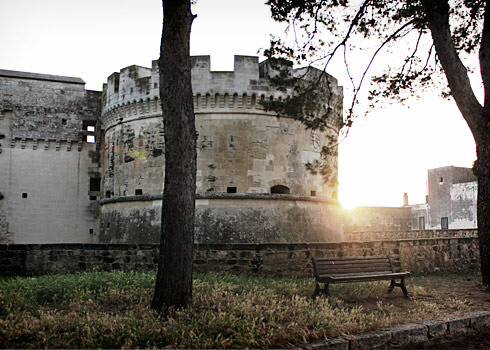 Soak up the exotic flavour of Salentine Greece: ancient traditions of Greek origin still survive in some parts of Salento, namely Soleto, Corigliano, Martano, Calimera. Acaya Castle – panoramic view. Visit Acaya, a small village still surrounded by walls, founded in 1500 by the architect Gian Giacomo whose style profoundly influenced architecture in subsequent years. The castle with its round towers and trapezoidal keep is frequently the venue for important art and architecture exhibitions. There are plenty of opportunities for cycling tours and horse riding.. Experience the thrill of speed on the La Conca international go-kart circuit. The I Giardini del Sole sports centre, close to the Oasi Salento, offers five-a-side football, basketball, tennis and other sporting activities. Every night the beach resorts host Happy Hours, with aperitifs, music and performances by DJs directly on the beach. There are numerous discos in the area, served by a night bus service. The legendary Babilonia, in nearby Sant’Andrea, with its concerts and jam-sessions, is a must. Read the latest news on our Blog Blog or contact us if you require any information about excursions..